Due to popular demand and our April 20th Gin tasting selling out so fast we are hosting a Super Salon Social on a Saturday! Join us for an enticing spirit tasting session hosted by an award winning Spirit Evangelist. This week we will dive into the complexity of Gin and what makes this popular spirit so fantastic. Hopefully we still have some Citadelle Cherry Blossom Gin for you to taste! 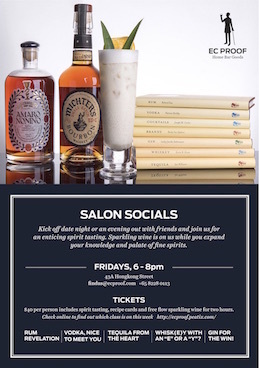 A perfect way to kick off date night or an evening out with friends to expand your knowledge and palate. Enjoy a welcome drink, then embrace the rich world of spirits and learn to make a cocktail to impress your friends at home. Make a night of it and let us help you make dinner reservations at 28 Hongkong Street or any of our neighbouring restaurants; Amo for casual Italian, Vasco for Latin American, FOC for Catalan cuisine, or Baccanalia Kitchen for contemporary French.